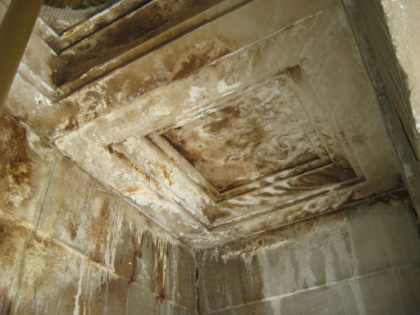 Severe and widespread infiltration and damage resulted from masonry design flaws. PL:BECS accurately predicted seismic-failure locations affecting masonry elements of this church due to intimate familiarity with masonry construction. PL:BECS has long-term, wide-ranging expertise in masonry structures whose exterior walls consist of structural brick, concrete block masonry, or structural concrete. Direct experience with analyzing numerous problems, such as infiltration and stress-cracking, has been fully incorporated into PL:BECS recommendations concerning the design and construction of new structures. Comprehensive familiarity with masonry construction has also allowed PL:BECS to serve as expert witness and arbitrator in resolving masonry-related disputes.